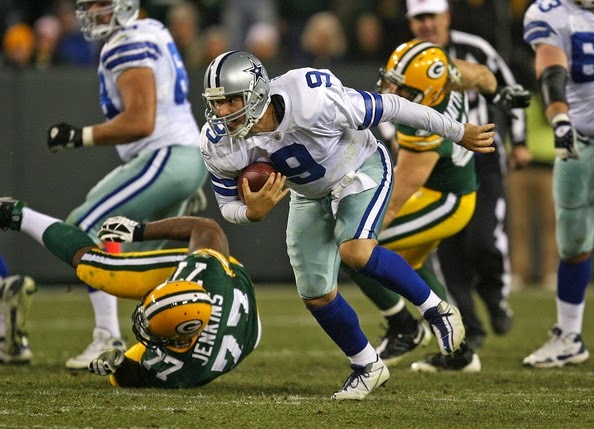 Can Tony Romo score a legacy-altering win at Green Bay this weekend? One of our editors thinks so. We began our Divisional Round preview with the AFC games earlier today, and now we move on to a pair of highly intriguing contests in the National Football Conference. Led by a match up of Blue Chip franchises (and completely different, but equally important fan bases), the Packers hosting the Cowboys is sure to be a ratings bonanza. Then, the suddenly hot Panthers travel to face reigning Super Bowl champion Seattle. Let's get right into breaking each game down. These players will never be on the field together at the same time, so that will either make them easier to watch (because you'll be able to focus on one of them) or extremely hard to watch (as I've listed both yet you'll never be able to see both) depending on how you interpret the semantics. But that's not the point. These two players represent the counterpart to Seattle's two biggest strengths - the Wilson-Lynch zone read, and the Sherman-Thomas tandem in the secondary. If the Panthers want to have any hope of even keeping this game respectable, they'll need both of these guys to have the absolute games of their respective lives. Kelvin Benjamin will need to beat Richard Sherman for big gains down the field, and needs to be able to convert red zone opportunities into touchdowns. Kuechly will need to make all the right reads and rally to the football. Anything less than 10 catches for Benjamin and 20 tackles for Kuechly will probably mean Seattle wins easily. Benjamin probably has slightly worse than a snowball's chance in hell of reaching that goal, but the superhuman Kuechly could conceivably be the best player on the field and keep Carolina in the game. While corner Richard Sherman is often the most discussed member of Seattle's "Legion of Boom" secondary, Thomas may be the unit's most indispensable player. Leading all Seattle defensive backs with 97 tackles, Thomas has put to rest thoughts that he simply plays centerfield in the Seahawk secondary. He only has a single pick this season, but Thomas' ability to close on the ball in the intermediate to deep passing game has once again helped Seattle lead the league in pass defense, surrendering under 3,000 yards all season. Seriously, that's ridiculous. Those numbers would look good in the late-80s, much less the pass-happy modern league. Thomas will once again be the focal point for Seattle's defense, moving around and looking to confuse Cam Newton, not to mention the job he'll be doing in run support against Newton and the suddenly stellar Jonathan Stewart. If Seattle is to smother Carolina the way many think they will, it will largely be due to the play of Thomas, the league's best safety. People are pointing to Carolina's last five games as evidence that they've turned the corner and might be a legitimate threat in the NFC. But while that might very well be true, Seattle's last six weeks clearly trumps it. They've outscored their opponents 134-39 (that's an average of roughly 23-6), and while Carolina convincingly beat Arizona by 11 and outgained them by a staggering 310 yards (!) last week, Seattle beat them by 29 and outgained them by an even more eye-popping 380 yards (!!!) less than a month ago. Compared to last year, both teams underwhelmed for the first 10-12 weeks of the season (Seattle started 6-4, Carolina started 3-8-1), but both have done gangbusters since. Seattle, though, has clearly been better. Carolina won handily last week, but they were buoyed by arguably the worst quarterback performance in recent NFL playoff memory. They went up against a quarterback who couldn't escape the pocket to make plays, and the throws he made in the pocket might as well have been made on the run. Now they're going up against one of the most accurate passers in the league who can also make plays on the run outside the pocket. They're going from one of the easiest offenses in the league to defend to one of the hardest. On top of that, they're going up against the best defense in the league, and one that has absolutely shut teams down over the last two months. Carolina moved the ball fairly well last week, but that was against a reeling defense, and they were aided by a number of absolutely brutal punts (Arizona punter Drew Butler had kicks of 28, 33, 31, and 31 yards) that led to short fields. The Panthers didn't have a single drive of more than 60 yards all game. Between three Arizona turnovers and several more three-and-outs, Carolina racked up 14 total possessions and held the ball for 37 minutes of game time. But they managed just 386 yards, which amounts to just 27 yards per drive. That would have ranked 26th in the league over a full season. And again, this was against a not-so-great defense. Seattle should be able to swallow up most of what Carolina does offensively, and this game shouldn't be too different from Carolina's game this week, just with Carolina on the wrong side. Love the way the Seahawks played to end the year, especially on defense, and I think we're headed toward another showdown between the Seattle defense and a legendary quarterback on Super Sunday (though I think it will be Brady this year). All that, and I'm still not buying the Panthers as being much improved. In actuality, they're an average team (at best) that has benefited from both simply playing bad teams down the stretch, and facing a pretty good team that was down to its third or fourth option at quarterback. I think any halfway decent team could have made Carolina's run, but it's going to take far more than a halfway decent team to win in Seattle. Gimme the Seahawks in a comfortable win. This is a bit of an "Oh, do you think so, doctor?" moment, but Green Bay's success really comes down to how much of a factor Rodgers' calf injury turns out to be. As of now, Rodgers is listed as probable despite missing practice Wednesday and being a limited participant Thursday. It was released Thursday that sources report Rodgers has a slight tear in addition to a significant strain in his calf. He's still expected to play, but it appears that he won't be 100 percent (and may even be noticeably less than that). As we learned last year, the Packers without Aaron Rodgers are not the Packers, but at the same time, we've seen that Rodgers can game through an injury and lead Green Bay's offense, like he did in the fourth quarter against Detroit in Week 17. Still, there are a number of factors up in the air, like how much in-game adrenaline affected his return in Week 17, or whether prospective cold temperatures at game time with exacerbate the condition. If Rodgers is close to 100 percent, we probably won't be able to tell the difference. And against a sub-par defense like Dallas, that's probably good enough. But with an offense like the Cowboys have, you don't want to give their defense any favors. And a severely hobbled Rodgers, or, God forbid, Matt Flynn, is doing them a big favor. The Cowboys have mostly played defense with smoke and mirrors this season (seriously, the Boys are 26th against the pass and 19th overall, but still make plays when they have to), but last week's performance from Spencer gives me hope that Dallas could actually get some pressure on Aaron Rodgers. Despite appearing in 13 games, Spencer had just a half-sack all season, and rarely entered opposing backfields. Now, apparently fully healthy and focused, Spencer seems ready to make an impact. He began last week with a sack-strip that nearly ended the game (rookie defensive end DeMarcus Lawrence recovered the fumble, then fumbled himself to give the Lions a first down), and seemed to have a foot in the Detroit backfield each time he stepped on the field. For a defense that has been unable to generate much pressure without blitzing (defensive end Jeremy Mincey leads Dallas with just 6 sacks), the sudden addition of a guy that can beat single blocking and generate a rush could go a long way. Or he could regress to his recent form and be a total non-factor, which would give the Cowboys very little chance of slowing Green Bay. This is the first playoff match up ever to feature a team that went 8-0 at home in the regular season hosting a team that went 8-0 on the road in the regular season. The Packers were ridiculous at home, winning half those games by at least 21 points, and averaging 40 points per game offensively at Lambeau Field. They also knocked off a trio of playoff teams (New England, Detroit and Carolina), plus a 10-win Philadelphia team in front of their home fans. But as good as Green Bay was at home, Dallas' road successes may be even more impressive. The Boys won five of their road games by double digits, and were the only team to win in Seattle this year, defeating the Seahawks on the road in Week 6. In that 30-23 win, Dallas also scored the most points a visiting team has scored in Seattle since Pete Carroll came to town and built the Seahawks into a yearly championship contender. Basically, Dallas' offense has traveled well and Green Bay has been unstoppable at home. Something has to give. As a gambler picking a game with such a major injury in play, this is really the only path to take. I pick Green Bay to win but not cover - I can't lose both, and there's a nice middle where I can win both. At full strength, make no mistake about it - Green Bay is the superior team. They have a better offense, a better defense, and (probably) the better coach. They have "home-field advantage," although it should be noted that Dallas went 8-0 on the road this year, so that might not matter here. But Rodgers' injury throws the whole game into uncertainty. Given what we've seen from Rodgers this year, I think it's pretty likely that he plays and plays well enough for Green Bay to be in the game until the end. Even if he's limited, Dallas just doesn't have a defense good enough to fully take advantage. I think the Packers pull it out in the end, but Dallas stays close enough to cover. B. Romo is having a legacy-altering season that I don't want to see end quite yet. Add in the fact that Aaron Rodgers may be hobbled, and the Dallas defense might actually be able to generate some pressure, and heck, I'll ride with Dallas on a suicide pick. Hopefully there's a little less Chris Christie on Jerry Jones action this time around though.